Can't get more clear than that. The US presence in Syria is illegal. Tuesday, July 10, 2018. It's anniversary time -- one year, in fact. July 9th of last year, the Iraqi government, led by prime minister Hayder al-Abadi, declared Mosul liberated. How's that gone? All that 'success.' Hard to believe the Iraqi people didn't storm the polls on May 12th to vote for Hayder and give him a second term? It's only hard to believe if you bought the crap the corporate media was selling in the long lead up to the Iraqi elections. It's been a year since the battle for #Mosul, #Iraq. With more than 90% of infrastructure and properties obliterated on the west side, people's lives, livelihoods, and lifelines have also been destroyed. That's what 'liberation' looks like. What a proud moment for the whole world. In a coffee shop, where many workers used to gather after a hard day of cleaning up ruins of devastated buildings, blames were heard for the Baghdad government's neglecting the city. A young man smoking a traditional water pipe, or Shisha as Iraqis name it, said he heard media reports on funds allocated by the Baghdad government to rebuild Mosul, but "actually we haven't seen any progress by this money. I wonder was it true or stolen by corrupt officials?" "Dozens of thousands of people cannot come back to their homes, because they don't have money to rebuild their houses, not to mention the lack of basic public services in their neighborhoods," the young man said while he was inhaling deeply from the mouthpiece of the Shisha and exhaling a jet of white smoke. "Can you imagine the misery of the people here, they even using water wells while the world is watching us?" the young man said, blaming the situation on corruption and failure of Iraqi politicians. 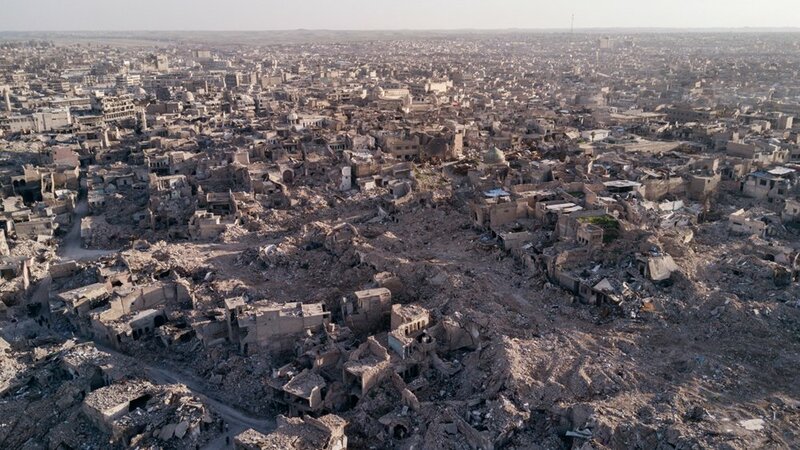 Islamic Relief notes, "Tons of explosive remnants are still littered all over the city and hundreds of thousands of people remain displaced because it is too dangerous for them to return home. Schools, hospitals and other public facilities have been damaged and destroyed." Liberation, or 'liberation,' resulted in what is called the worst battle since WWII. What did that battle look like? A massacre. A massacre where civilians couldn't be distinguished from combatants. That's called a War Crime, by the way. The violence never ends in Iraq. Margaret Griffis (ANTIWAR.COM) notes, of Monday's violence, "At least 34 people were killed, and 11 were wounded in recent violence." truvada's subliminal hiv insult to gay men? First ISIS, now Del Monte, when will the explosions end? THIS JUST IN! ALYSSA GIVES A HARD NO TO TERRORISM!